Passenger train derails near Togo, Sask. Some Via Rail passengers had their travel plans interrupted but were uninjured after a derailment near Togo, Sask. on Sunday. It happened around 6 p.m. CST, close to the hamlet, which is located in the east-central part of the province next to the border with Manitoba. According to Via Rail spokesman Jacques Gagnon, seven passengers and four crew members were aboard when three of seven rail cars went off the tracks. The train had left Winnipeg bound for Churchill. None of the passengers required first aid, Gagnon said. The passengers were taken by ground transportation to a lodge in nearby Duck Mountain Provincial Park. 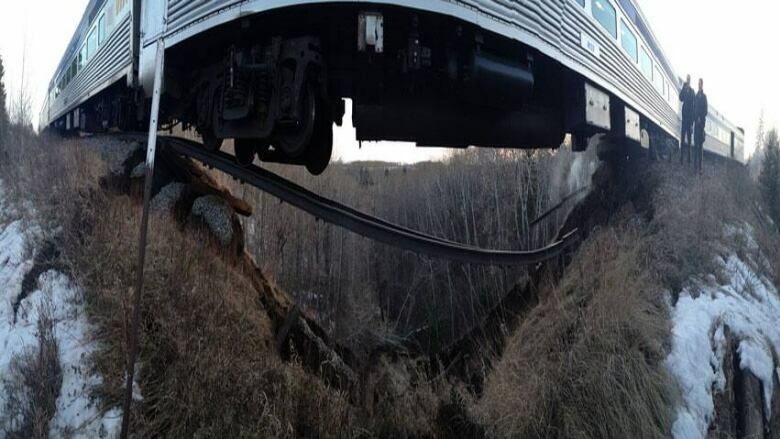 RCMP said the tracks had been washed out where the train derailed. There had been heavy spring runoff in the area. A small fire broke out on one of the locomotives, but it was quickly extinguished, the RCMP said. It could be another two days before that section of the rail line can be used again, according to Via spokesman Gagnon.